We are consecrated religious in the Catholic Church and members of a Congregation founded by Venerable Mary Angeline Teresa McCrory dedicated to the service and care of the Aged and Infirm, in the spirit and tradition of the Carmelite Order. We are women who share a vision that love makes a difference in the world. We are diverse in age, background and training but are united in our belief that life is precious, from the moment of conception to its natural end. Life is full of memories pieced together to form God’s handwoven tapestry. Our story is tied to the story of every man and woman at the autumn of life – their joys and sorrows, their pains and consolations, their love of family, their hopes and dreams, their search for God and their finding Him. Our life is about holding the hand of an aged person and giving meaning to their lives. It is about being a mother, a sister, a daughter and a friend to someone who is another’s mother, sister, friend and loved one. We are Carmelites who follow the Rule of Saint Albert and are nourished by the tradition and examples of Saint Elias, Mary, St. Teresa, St. Therese and many holy men and women of the Carmelite Order. 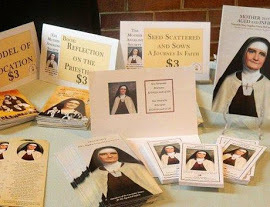 We follow the example and vision of our foundress Venerable Mary Angeline Teresa McCrory. We minister to Christ in the person of the elderly but always return to the spiritual mount of our prayer and contemplation.